Promoting Business to Serve and Improve Revenue - Brilliant Breakthroughs, Inc.
Are you showing up in a good way in your marketplace? Promoting Business to Serve and Improve Revenue is part of your business’s success equation. Often my clients have altruist ideas for their business’s offerings. I thoroughly enjoy working with these clients! They are extremely positive, energetic, and eager to try anything new if it might deliver better results. Additionally, they are enthusiastic because their business concept is fueled by their passion. Clients who want to help others improve their life or business are a majority of my business. Yet, when it comes to promoting business, they hide behind a boulder. This behavior is completely counter-productive to them serving others. To say the least, it’s an interesting paradox! Promoting business requires right action. 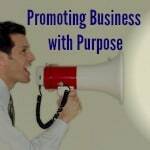 Let’s look at promoting business to (a) serve, and (b) improve revenue. Every business serves. Many businesses serve the greater good with their service. Gee, even I do this! Many Business Coaches are all about making a profit. But not many Business Coaches have been a CEO nor do they focus on a business’s most important resource: it’s human talent. I focus on helping leaders and businesses optimize performance. This also includes honoring the most important asset: humans! More specifically once the leader or management team begins to become more aware of how talent is being depreciated or appreciated, the business’s performance will improve. Definitely a more comprehensive approach with multi-potent results. Perhaps it’s just the Minister or former-CEO in me… either way, I value people and know they’re essential to organizational performance! BIG TIP: If you want to serve more, it is imperative for you to get out and meet more people to promote your offerings! Right now I’m sure you are saying, “Duh, Maggie, of course this is truth.” Promotion will improve your revenue… greater visibility always does. BIG QUESTION: Do you know what is the best way to promote your offerings? I just spoke with a client who is a Doctor in a private practice. The doctor finally came to the conclusion that it’s time to start promoting them-self as a professional speaker. What happen next in the conversation amazed me. They are already an expert in topic “A” and personally enjoy topic “B”. They started telling me how they could start speaking about “B”, which isn’t their expertise at all! They wouldn’t be able to capture one valid lead from this path. Going down that path would not improve the overall performance of their business. Then the magic happened. I asked, “How could you, as an expert, make an impact?” Immediately I heard a phenomenal need for this expert to speak to a very specific audience (target: potential customers) to solve an industry wide affliction. Which, get this, is already this doctor’s expertise! BINGO! That will improve revenue and the overall performance of the business. BIG TIP: Which ever actions you choose to take for promoting your business, make sure it will fulfill your business’s overall goal, vision, or mission. If you do this, it’s a golden action which will ultimately improve your bottom line. Want to praise fellow Wisconsin Business Owner: Greg Adlington, at Next Gen Commercial Capital LLC for significantly impacting a whole community with the business he offers. Check him out! please reach out to Maggie (262) 716.7750 for YOUR No-cost Consultation.